While watching the news, reading the paper, or even checking your favorite social media sites, occasionally we stumble across stories about discoveries scientists have made related to how genes contribute to obesity, or how scientists have discovered a cure for Ebola virus. These findings are important for human health, but if you look closely, you’ll find that these results have come from animals such as mice and monkeys. Occasionally, you’ll even hear of scientists using yeast, plants, fruit flies, and even tiny roundworms! Why do scientists use these seemingly bizarre organisms at all, and why are there so many different ones? These various plants and animals are referred to as “model organisms.” The list of model organisms is long and ever-growing, as new organisms emerge as great systems for studying a variety of processes. 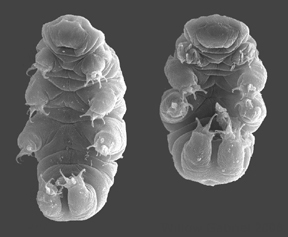 For example, newly popular “water bears” (pictured to the left) are being actively developed as a model for studying heat resistance, starvation, and even space travel! Generally, we use model organisms for a number of different reasons. One of the biggest reasons is that these organisms are very easy to work with – they can easily be kept and raised in a lab, they can be bred easily, and they develop from embryos to adults quickly. When working with human subjects, there are several levels of regulation that must be overcome. In general, the more complex, or “advanced” the animal is, the more that must be done to run experiments involving them. Other reasons tend to be specific to the organism being used. Some of the most widely-used model organisms in biomedical sciences have classically consisted of baker’s yeast, frogs, zebrafish, roundworms, fruit flies, and mice. The use of mice, perhaps the most publicized model organism, is fairly intuitive – mice are also mammals like us with fairly similar development and physiology. This makes it easy to study human diseases, drug treatments, and cancer. But what about the less publicized model organisms? Studies in baker’s yeast, one of the simplest model organisms, have been essential for understanding exactly how cells undergo the cell cycle – duplicating their DNA and dividing into two cells each with a copy of the DNA. Frogs lay a large number of embryos which all develop externally; this has allowed scientists to extensively study the process of development from an embryo into an adult animal. Zebrafish and roundworms are both nearly transparent, making it possible to watch development and other processes as they occur in living animals! Zebrafish even have the unique ability to regenerate their heart muscle, which could have implications in human heart health following heart attacks. 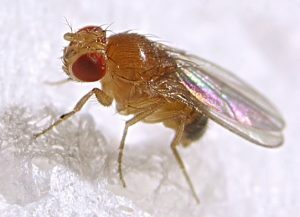 The fruit fly is one of the most extensively used model organisms. Surprisingly, humans and fruit flies have very similar genomes. Many of the genes found in humans have very similar counterparts in flies, which makes it possible to study some basics of human development and disease even in these animals! Fruit flies are also frequently used to understand other behaviors, including response to odors, activation of the innate immune system, and courtship and mating. Since 1933, six Nobel Prizes have even been awarded to fruit fly researchers! Just last year, three scientists were awarded the Nobel Prize for using the fruit fly to study circadian rhythms – the “molecular clock” within each of us that regulates when we do daily activities like eat and sleep. 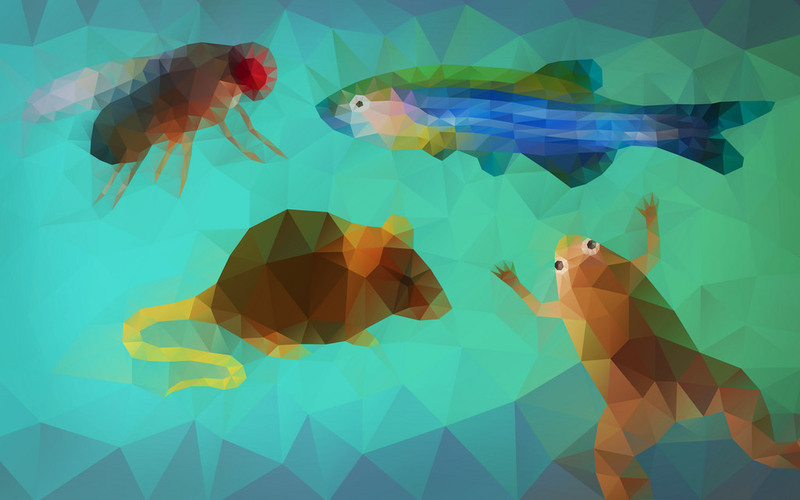 Over the years, model organisms have provided an incredible amount of information about biology, from how cells divide to how animals choose a mate, from how an animal develops to what goes wrong in diseases and cancer. Of course, scientists have to constantly consider how much of their findings are specific just to that one organism, but studies have shown incredible similarities across the animal kingdom. By understanding these other, simpler organisms, we are able to learn more and more about animal diversity, similarity, and even our own health and development.